Until now, there have really been only two choices on the market: the long plastic wand and the half-moon. Both work well enough but we believe we’ve designed one that works even better. Our 7″ handle is made from naturally water-resistant Western Red Cedar, which makes it comfortable to hold as well as slip-resistant. 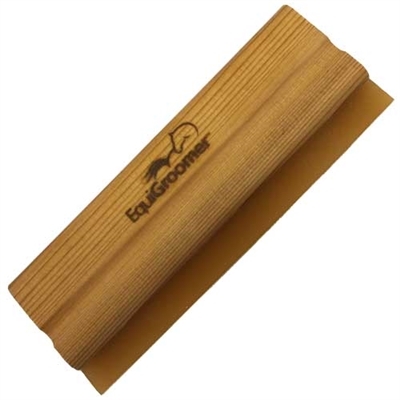 The blade is made from tough but flexible polyethylene so it’s very effective at removing water from the coat, even on bony areas such as hips and knees. Although the WaterWisk was originally designed as a sweat scraper for horses, you’ll find a hundred other uses for it. Use it on your dogs after a bath or swim, your tubs, your wash stalls or wherever you have water you want to “wisk” away.